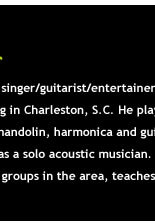 Dave Berry is a veteran singer/songwriter now living in Charleston, S.C. He plays acoustic and electric guitar, dobro, mandolin, harmonica and guitar synth. He is working full time as a solo acoustic musician. He also freelances with various groups in the area, and teaches guitar. By the age of 14, Dave was playing in a garage band with a "house" gig at a local bar in Maryland. He later worked in Maryland and Virginia with rock bands that had names like Faze, Nasty Habitz, and the Shift, as well as with the recording groups Dirty Deal and Cracked Actor. In 1983, Dirty Deal recorded its first self-titled album. It was released nationally in the United States and it landed a spot on the indie sales chart. The band toured and opened for acts like Ratt, Saxon, Kix and Tokyo Blade. In 1989, Dave joined the group "Cracked Actor". In the four years with the band, they released 5 self produced albums, wrote and recorded the music soundtrack to the Gemini Productions movie "Sleeping Beauty", and opened for groups like Kix, Nuffs' Enuff and Winger. With this group, Dave won many awards, such as best guitar, best vocals, best band, best live show, best manager and best road crew from the Music Monthly's Annual Readers Poll. 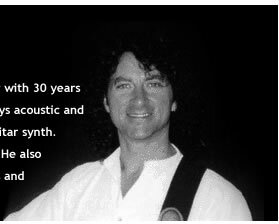 He also worked as a guitar instructor at Victor Litz Music in Gaithersburg, Maryland for six years. During this time he also hosted and organized "open mics" in Rockville and Hagerstown, Maryland. Dave also performed with the acoustic duo, the Mighty Chihuahuas. This group was formed with the concept of working in resort areas. Since their start in November of 1994, the group (Dave Berry and Jeff Key) has performed in the Baltimore/Washington area, Pennsylvania, Virginia, Ocean City Maryland, Wilmington, Rehoboth and Lewes Delaware, Cape Hatteras, Ocracoke North Carolina, Key West Florida, Vail and Copper Mountain Colorado, Cape Cod Massachusetts, Killington Vermont ski resorts, University of Oklahoma, and Salisbury Maryland. Notably, Dave and the Mighty Chihuahuas have spent a great deal of time performing in the U.S. Virgin Islands. He has opened for national acts in the past such as The Fabulous Thunderbirds, Martha Reeves and the Drifters and Jan and Dean on the 4th of July year 2000. He has won awards from the Maryland Music Monthly Readers Poll in categories such as best acoustic duo, best guitar, best male vocalist, best harmonica. In 1998, Dave won the Music Monthly's Readers Poll in the categories of best acoustic guitar and best in acoustic genre for the Mighty Chihuahuas duo. Sound familiar? Experience Dave for club performances, private parties, weddings (or divorces), festivals or whatever your music needs may be, big or small. He's done it. The Songlist Dave has hundreds of songs for the audience to choose from. Musicianship Dave has a veteran history of consistent award-winning talent. Interaction Dave hands out a songlist, percussion instruments such as tamborines and maracas and uses fun skits to get the crowd involved in his show. Technology Dave holds sponsors with Godin Guitars, L.R. Baggs and BartoliniPickups and Electronics. He also uses a Roland Guitar Synth, Boomerang Phrase Sampler, Taylor Guitars, Martin Guitars and some of the bose sound reinforcement gear on the market. Wireless technology allows Dave to wander and interact with the audience during his performance!